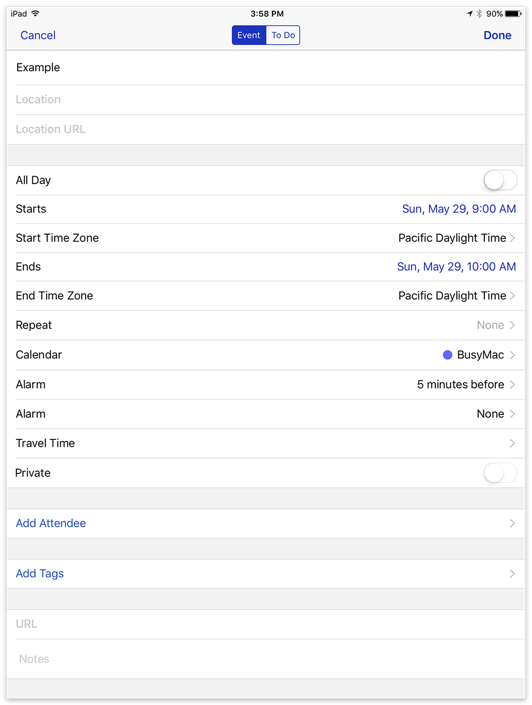 The Event Details view displays the details of the selected event or to do. 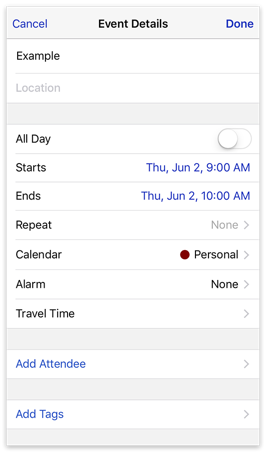 The Event Details view appears when you create a new event or to do, or when you tap an existing event or to do in your calendar. The Event Details view can be customized to show only the fields you want to see. Show Location — Displays a text field for entering location information. Show Location URL — Displays a URL field for entering location URLs, such as a link to Google Maps. Show Start time zone — Displays a time zone menu for the event start time. See Time Zones for more information. Show End time zone — Displays a time zone menu for the event end time. See Time Zones for more information. Show Travel Time — Displays a menu enabling you to see or specify the travel time to that event. See Travel Time for more information. Show First Occurrence — Displays the first occurrence date of a repeating event and current sequence number. Show Attendees — Displays a field for adding attendees. See Meetings and Invitations for more information. Show Tags — Displays a field for entering tags. See Tags for more information. Show URL — Displays a URL field for inserting links. Show Private — Displays a switch to indicate that the event is Private. When sharing a calendar with others through Exchange, Google, and some CalDAV Servers, events marked Private appear to other people with a title of “Private Event.” The event blocks your free time for scheduling purposes, but no other details are shared. 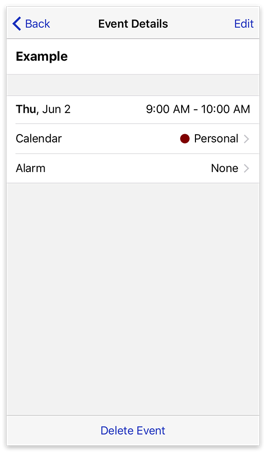 Note: This switch is enabled only when syncing with a calendar server that supports this feature. It is not supported by iCloud. 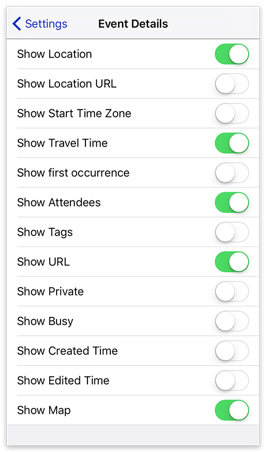 Show Busy — Displays a switch to indicate whether an event affects your availability as free or busy. Show Created Time — Displays the date and time the event was created. Show Edited Time — Displays the date and time the event was last modified and the user or device that last modified it. Show Map — For events with specific locations (generally, an address or city name), displays a map of the location at the bottom of the Event Details view.